Amateurs have always suffered from various sorts of interference, be it that electric drill next door, a local electric fence or more natural sources like thunder static or even solar noise. However in recent times these have become far more of a problem with the vastly greater number of electronic gadgets which have become a necessary part of today's living. At one time the worst we got was line timebase interference from a local TV, but nowadays not only do people have several TVs, videos, DVDs in every room, but they also have one or two computers. Every one of these devices have the potential to put out unwanted radiation on the amateur bands and other parts of the spectrum. So called 'wall wart' mains adaptors often contain switch mode power supplies, notorious for their QRM. In the past few years a new type of device has joined the throng - power line network adaptors which deliberately put shortwave energy into the mains supply to allow the user to link his computers within his house. You would have expected that introduction of EMC regulations in the European Community and elsewhere would have prevented most of these problems. But although the equipment is claimed to be compliant to the appropriate standards and carries a little 'CE' sticker to declare so, it seems this means nothing. It is even known for companies to do tests on a sample with extra components fitted to get them through the tests and to then remove those components in the production units! And it seems that enforcement through trading standards, who are hopelessly underfunded, is powerless to stop these practices. This page outlines some of the current EMC issues affecting radio amateurs and short wave listeners and what to do if you suffer them (other than going QRT). This issue first came home to me when I assembled a new PC last year. I soon found that it put out wideband hash on 80m and to a lesser extent on 160m and 40m, and it was impossible to use those bands while the computer was powered up. I had used, as is usual, a desktop case with built in ATX PSU, and I established fairly quickly that the QRM continued unabated when all output leads were disconnected and only the mains lead was plugged in. Taking the power supply out and examining it I soon found that there were no mains filtering components fitted on the printed circuit board, although there were markings for those components on the silk screening. 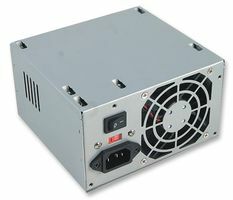 Initially I decided to buy a new power supply from one of my suppliers. I was somewhat disappointed to find that the noise was unchanged with the new psu, and on examining it I found it also was lacking its mains filter components. If two power supplies from two seperate suppliers had this problem, how many others were there out there? Having loads of scrap TV circuit boards to hand, I soon found some appropriate mains filter components and fitted them to the supplies. These are normally a dual series choke of a few mH and shunt ceramic capacitors. It is vital to use the correct standards of components, particularly the capacitors which must be of mains rating, hence I used those from actual filter circuits in a television (and most televisions and vcrs DO have the filter components fitted!). This is not a modification I would recommend doing unless you know what you are doing. In my case, having fitted the filter components my QRM had totally gone away. Incidentally I found adding ferrite rings and other external filter components to the supply lead totally ineffective, probably because it is impossible to get sufficient filtering for the lower frequencies - the built in filters have a cut off frequency below the psu switching frequency (typically 25-70kHz) which you cannot achieve with a couple of ferrite rings! This subject has been discussed regularly by Dave Lauder G0SNO in his RadCom EMC column and is something the RSGB EMC committee is well aware of. But with the vast number of these supplies in use it will be a nightmare to address, and even tracing the source of interference might be very hard. My gut feeling is that this particular source does not spread very far and is likely to be in your own house or a neighbouring one. Cure is not obvious as although there are many filtered supplies available there are also many which are not and it seems hit or miss which you get. Beware of claims of 'low noise' in marketing specs, it usually refers to a quiet fan and nothing to do with electrical noise! 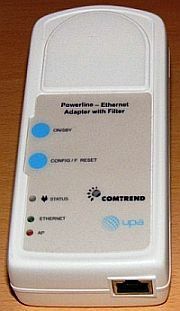 Powerline communications, PLC or PLT (BPL in the USA) is a technique for sending computer data over the mains power lines. It comes in various forms, as the Wikipedia article explains. Originally it referred to a method of distributing broadband via the electricity company network, allegedly to reach areas out of range of more traditional methods. This is in itself a misnomer, since in order to pass the signals over power lines repeaters at regular intervals are needed, which makes if far too expensive for use in remote areas. Such 'Access PLT' has been fairly extensively trialled in the USA, and the ARRL has been leading a campaign against the interference caused to their amateurs for some years, with a recent successful court case against the FCC. Here in the UK there were a couple of small trials at Crieff in Scotland and Basingstoke, but neither of those came to anything and nobody is persuing this system here at the moment, With the current wide reach of internet access via ADSL and cable it is hopefully no longer going to be an issue here. Far more significant to amateurs and other users of the hf spectrum is the so called 'In- House PLT' which is used to pump ethernet signals through the mains system of houses, or in some cases blocks of flats. It basically replaces normal ethernet network (CAT5) cables with the mains and saves routing of cables or using wireless networking. This is clearly of great interest and advantage to the home computer user, but it has the obvious drawback that the mains is not designed to carry high frequency digital signals, and because it is a very unbalanced network which is guaranteed to radiate. Although these units have been available in computer shops now for a few years, at around £50 for a pair their use has been somewhat limited. But recently BT has been supplying the units to those who subscribe to its BTVision product - a kit which includes a Freeview hard disk recorder, a BT Home Hub modem, and a pair of Comtrend DH10P powerline adaptors. Since the package is available at an attractive price, and in some cases free as an incentive to renew internet packages, this has been very popular and there are thought to be hundreds of thousands of them in use. It was not long before shortwave listeners and amateurs started to notice severe interference on their receivers. The units use the whole spectrum 2-30MHz with the UPA powerline system, with fairly deep notches in all amateur bands except our experimental 5MHz channels, but there is no filtering in the broadcast bands. It was found that interference could be heard several hundred metres away and was s9+, sufficient to block all but the strongest of stations. Even worse, they put out the noise 24/7, unlike the alternative HomePlug adaptors which only radiate when they are handling network traffic. Even within amateur bands there was a noticeable increase in background noise levels. Although carrying a CE mark and claiming they met current EMC regulations, clearly they do not. Independent tests have indeed proved that they exceed the EMC limits by more than 20dB. Fortunately at the moment I don't suffer from this problem, but many amateurs in built up areas will. We demonstrated a pair at our radio club recently and the interference outside the (notched) amateur bands is devastating. The RSGB EMC committee for some time has been looking at the products, and has been making approaches via Ofcom and Trading Standards but with little success. However more recently an affected short wave listener Mike has set up a Yahoogroup specifically to address this issue. If you suffer then it might be worth you joining that group - http://groups.yahoo.com/group/UKQRM/ and share your experiences. The group has to date been fairly successful in that several cases have been reported to Ofcom and as a result of their investigation BT have contacted the BTInternet customer and in most cases replaced the offending adaptors with wired ethernet. But it is unclear at the moment what the long term situation will be, as unless Trading Standards force BT to recall the product (unlikely) they will have to sort out each interference report on an individual basis. Manpower at both BT and Ofcom will mean this will only attack the tip of the iceberg. There will be many users of these boxes unaware that a near neighbour has interference. RSGB EMC Committee pages - several interesting documents to download, some sound clips. Second Downing Street Petition - demanding devices failing the EMC regulations to be drawn. The subject of plasma sets has been covered from time to time in G0SNO's EMC column in RadCom, and there was an excellent article in the August 2007 issue relating to a German amateur and the response he got from the manufacturer Panasonic. Even they agreed that QRM is almost inevitable with these sets. In OT News Spring 2008, the RAOTA magazine, there is a long article by Peter GM3OFT about a problem he had with a neighbour's plasma set. He eventually reduced his interference significantly with a mixture of extensive mains filtering at the set and changes to his own antenna positioning. But he had cooperative neighbours, something most of us don't have even if we can identify the culprit among many sets in the area. I identified what I suspect was plasma interference here at G3YMC last winter. A fairly wideband buzzing hash, peaking at a few places and mainly on 160m with my vertical antenna. It was less of a problem on 80m and I could not hear it on other bands. Largely on during TV hours (till very late at night) and off in the daytime. I suspected it was next door but never proved it, and it seemed to disappear after Christmas (new set maybe?). Others have reported much wider QRM right up to 20MHz, so it obviously varies between models. One consolation is that LCD sets are usually quite quiet apart from the occasional one with a noisy switch mode supply. LCD technology is advancing and it is now possible to make much larger screen models. It is even suggested in some quarters that plasma is now old technology and may be discontinued, let us hope that is so.